Have you ever thought of how your email signature can be a form of marketing? So many conversations and transactions are conducted over email these days. That's why it's incredibly important to make sure your signature is working for you, and not just as a calling card. If utilized well, your email signature could be a great way to market your business and help others refer more business to you. So how do you maximize that small space at the end of an email message? Here are my top five suggestions on how to do just that. 1. Use your signature to highlight the type of work you want to do (not the work you don't want to keep doing). Of course, there is some basic information that appears in just about any email signature, like your name and title, phone number and email address. But as a translator or interpreter, it is also good practice to list your language pair(s) and specialization(s). 2. Spell out how you prefer to be reached. Does the thought of being called by a client make your palms sweat? Then don't include your phone number in your signature. If prompted by someone who would like to have a conversation over the phone, send it to them directly. This allows you to avoid any unexpected conversations that could interrupt your workflow or leave you feeling caught off guard. 3. Use your email signature to show when you're working (and when you're not). If you have set hours that you work on client-specific tasks, or take meetings, find a brief and concise way to include this. If you have a speaking event, conference, trip or some type of holiday in the near future during which you will be unavailable to respond to emails, include this at the end of your signature. I've personally found this to be both very effective in giving clients advance notice of my out-of-office dates, as well as a way to show that I am an active professional. I speak at events, travel for work and enjoy time off from time to time. Here's how I use my signature to include this type of information. 4. Show your expertise beyond your language skills. Surprise! It isn't all about the languages you work in or the specializations you have when it comes to promoting your translation or interpreting business. You can further show your professionalism to clients by including any other relevant positions you hold. 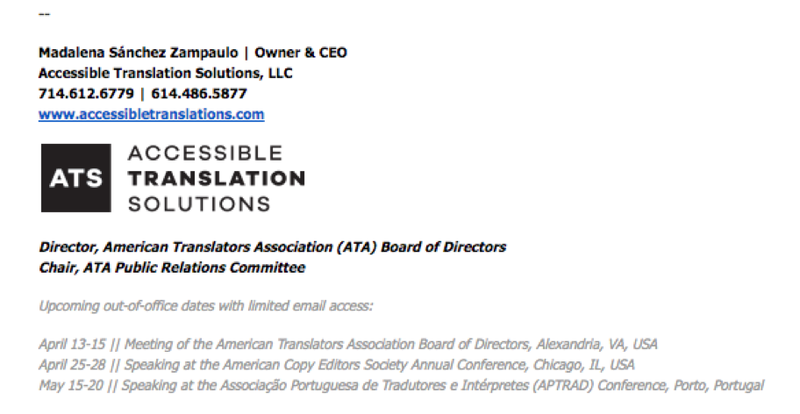 Do you volunteer with your local translators association? Include this information. 5. Link back to your website. When a client approaches you for the first time, don't you tend to click on the link in their profile that leads you to their company or organization website? Clients do the same with those they hire. Include a link to your website that is already hyperlinked. Better yet? Include your logo and hyperlink it. This allows people to click on just about any part of your signature and gain access to more information about you via your website. Before you think this list includes too many items for you to put in your email signature, take a moment to think creatively. You may have to maximize the small space by using different fonts and font sizes, but it can be done and it can also be visually appealing to those who receive your emails. Your email signature does not have to be static. Have fun and change it up! Try different ways of including information about yourself in your signature and think of it as a test. For example, when I started to include my upcoming out-of-office dates, I received replies from people telling me how much they enjoyed the place to which I'd be traveling. In fact, as it turns out, one of my clients was even scheduled to be in the same city in Europe the same week I was! For an extra personal touch, add your headshot or a brief video introduction to your signature. Just know that the more images or media you use, the longer it may take your email messages to load by recipients. Be as concise as possible with your email signature. Those who see it should not have to scroll down the page in order to capture all the information. Finally, make updates from time to time in order to keep your signature fresh and keep recipients interested in what you do.